MrGreen really is the “gentleman among casinos” in my opinion. First class customer service with open and transparent terms and conditions, a real commitment to prevent problem gambling which the whole industry should follow, excellent customer service staff who know their stuff, and a high quality selection of slots, casino games and live casino. For those who like a flutter on sports, there’s also a MrGreen sportsbook available, with many different sports, in-game betting available, and MrGreen special offer odds on various games and matches. I can’t recommend this casino enough, both for beginners and the serious gambler. It really is obvious why they have won so many awards once you’ve started playing there. It’s a pleasure to be able to offer an exclusive GamblingInformation.com free spin bonus to all new signup via our special link, so grab your 50% extra free spins and give MrGreen a whirl - you won’t be disappointed. MrGreen certainly receives our seal of approval. Hello, and welcome to another casino review. I’m Ed Roberts, one of the review team here at GamblingInformation.com, and I’m a semi-professional gambler who specialises in online casinos. 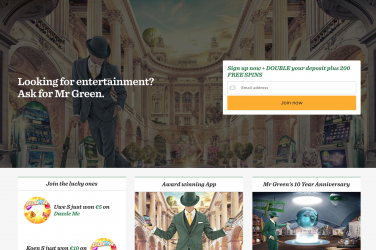 In this review we’re going to be looking at one of the most respected – and most award-winning – online casinos: MrGreen.com. The team behind MrGreen have an absolutely first class reputation in the online gaming industry, and they have won “Online Operator of the Year” at the IGA awards for 4 out of the last 5 years, as well as winning “Socially Responsible Operator of the Year” in 2017. MrGreen is one of the oldest online casinos, and this year celebrates its 10th year in business. I believe this is down to their amazing “customer first” attitude, which means it’s incredibly rare to find anyone who has anything other than praise for this amazing operator. Because I rate this casino among the best in the world, and to help celebrate their first decade on the internet, we’ve been able to get hold of an exclusive free spin no deposit welcome bonus for our readers on top of the standard offering. If you sign up for a free account with MrGreen.com via our exclusive GamblingInformation.com link you’ll be ready to play some free spins in under 60 seconds. When you try and find out who the mysterious Mr Green is, information is hard to find. However, this casino’s tagline is that Mr Green is the Gentleman among online casino operators, and as you’ll see the casino that bears his character certainly lives up to this billing. Claim Your 25 Free Spins! MrGreen.com prides itself on its range of high quality casino games. Because of their reputation, this casino does business with the best providers of casino games in the business, and there is plenty here to keep even the most discerning player happy for a very long time. For lovers of slots, MrGreen boasts over 300 very high quality video slot games. Not only are there plenty of well-loved favourites like Starburst, Gonzo’s Quest, and Gemix, but there are lots of “big name” branded games such as Guns n’ Roses, Ted, and Game of Thrones. When it comes to traditional casino games there is no less of a great selection to choose from. Highlights include over 30 versions each of blackjack, roulette, and baccarat. There isn’t much in the way of video poker , or other table games, but there are some instant win games and a dedicated section to bingo and keno. One of the very few criticisms I have of Mr Green is that there aren’t enough filters or sorting options, relying on just a few groupings and a search feature. I would have liked to see more of the casino games grouped by type, rather than having to hunt a little bit to find anything other than blackjack, which is the only casino game type that’s put into its own group. However, given the quality and quantity on offer this is a minor inconvenience rather than a major problem, and it doesn’t detract from the enjoyment of playing this casino. MrGreen’s live casino offering is nothing short of excellent. Boasting almost 40 live tables of the highest quality, there really is something here for everyone. Again, going above and beyond what other casinos can offer, MrGreen has their own exclusive, branded live tables. I believe this is one of the reasons for their excellent reputation – by keeping control of the game quality they can ensure their customers have good experiences. Live blackjack, live roulette and live live baccarat are all on offer, alongside tables for live poker including Hold ‘Em and stud versions. For those who like to bet big there are dedicated VIP and high roller tables, too. Every game is superb quality, and almost all feature HD streams. Croupiers are all extremely friendly and welcoming, and the casio ambiance is extremely good. All-in-all, MrGreen has one of the most accomplished live casino offerings on the market, and it’s suitable for both novices and high rolling experts alike. Once again, MrGreen leads the way where others follow, this time in the mobile gaming app. Winner of 2016’s “Casino App of the Year”, you can download it on both iOS and Android (4.1+) free of charge. Rather than just offering a mobile-optimised version of the desktop casino (which the MrGreen app does very well), mobile gamers also get access to some exclusive benefits like app-only special offers and bonuses, some exclusive games to play, and direct access to customer support via the app 24/7. Some casinos have seen their mobile apps as just an extension of the desktop experience, but MrGreen appears to have put a lot of money and development time into making the mobile experience on this casino a fully-featured and enjoyable experience. MrGreen.com does offer all new players a standard welcome bonus package, but as I mentioned we’ve been able to help them celebrate their 10th anniversary by offering you an exclusive extra welcome bonus, available only for sign ups through GamblingInformation.com link. New players that register with MrGreen through our link will receive an exclusive 25 free spins no deposit sign up bonus. We’ve timed the registration process and how long it takes us to be ready to play our free spins, and so far our record is 53 seconds from clicking the link. Can you beat that?! MrGreen will also give you a deposit bonus when you first add money to your account. As fits their customer ethos, this isn’t complicated, staged, or difficult to understand. Simply make a first deposit, and MrGreen will give you a 100% matched deposit bonus up to £100. On top of this you’ll also get 200 bonus free spins that you’ll receive as 5 per day for 20 days – so that’s 5 free jackpot opportunities daily for 3 weeks! This is where MrGreen.com really rises above the competition. This casino is extremely clear that it puts its customers first, and this is reflected in the support offering. Firstly, on a serious note, MrGreen is very upfront about being socially responsible. They want to make sure gambling stays a fun activity, and never turns into an addiction. All of MrGreen’s support staff are trained to help support and advise people who may be heading towards a problem, and their help section is full of great resources and hints and tips. It’s great to see a casino not hiding this issue away, and bringing it to the front. Well done. In terms of getting help for your experiences using the sire, MrGreen provides a number of resources. Customer support is always staffed by real people 24 hours a day, 7 days a week – even on public holidays. You can call a standard UK landline number to speak to someone, and this won’t cost you anything if you have standard UK calls covered in your home or mobile contract. Email support is also available at all times, and there’s a live chat service directly available from the website. In my tests, telephone calls were always answered within 1 minute, live chat within 3 minutes, and emails were responded to within 4 hours. That’s a great track record. Also, MrGreen’s support people are amongst the most professional and well-trained I’ve encountered. They really have invested in staff training, and everyone seems to be able to deal with problems straight away without having to refer matters to other departments. Another great touch is that MrGreen is very friendly for those who are new to casino gaming. There are great “how to play” articles on their help section covering every game type on their site, and you can free-play all of the slots so you can get a feel before playing for real. Another small point that I think they could do better, is that there’s no obvious “answer all your questions” FAQ. Instead MrGreen likes to produce comprehensive articles on certain subjects. I think some people would prefer a shorter, sharper FAQ – although the excellent site design means everything is easy to understand and navigate. Withdrawing and depositing money to your account is an easy task. As you’d expect, MRGreen accepts deposits via VISA and MasterCard credit cards and debit cards, bank transfer, various e-wallets and PaySafe card. A very nice touch is the unique “Quick Deposit” button that’s a feature of every game. If you find yourself running low on funds and you’re in the middle of a game, there’s no need to exit it to deposit – just use the “Quick Deposit” button and it will automatically charge your chosen amount to your last-used credit or debit card (you need to have made at least one account deposit before quick deposit becomes available). When it comes to withdrawing winnings, it’s incredibly simple – you can withdraw your winnings using the same payment method as you used for your deposit. If that’s not available then you must withdraw to your registered bank account. This is all a good compromise between security and ease of access. There is a small fee charged per withdrawal, which is 1% of the withdrawal amount to a maximum of £10 and a minimum of £1. Payout times vary depending on the account type, but typically take 1 day to hit a bank account, and 3 days to hit a credit card account. E-wallet withdrawals are available immediately.